The 2010 FIFA World Cup kicked off in South Africa on 11th June and four days later, the 7th International Security & Safety Expo & Forum (ISF) 2010 opened with more than 350 exhibitors. The World Cup fever infected many people but the impact of it was concealed with business as usual. ISF 2010 is an event held every two years in Kuala Lumpur providing opportunities for visitors to view the latest technology improvements in CCTV, Card Access, Time Attendance Systems, Integrated Security Systems and its related industries. This event provides an opportunity for us to educate consumers about the benefits of fingerprint and biometrics to their business. At the same time, we create an opportunity for dealers to look at our demo units and to understand the benefits of working with FingerTec. 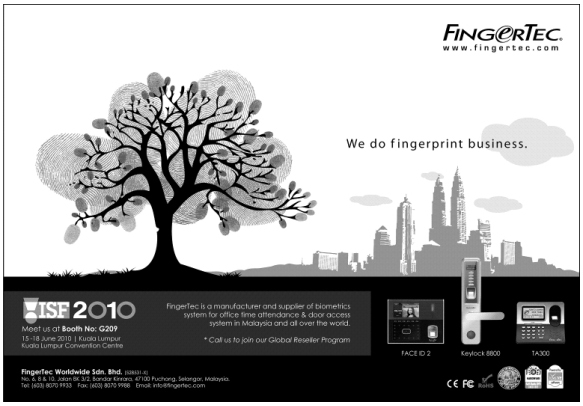 In conjunction with the ISF 2010, FingerTec advertisement appeared in two major national newspapers, The Star and Berita Harian, targeting different segments of the market with one sole intention, brand awareness. 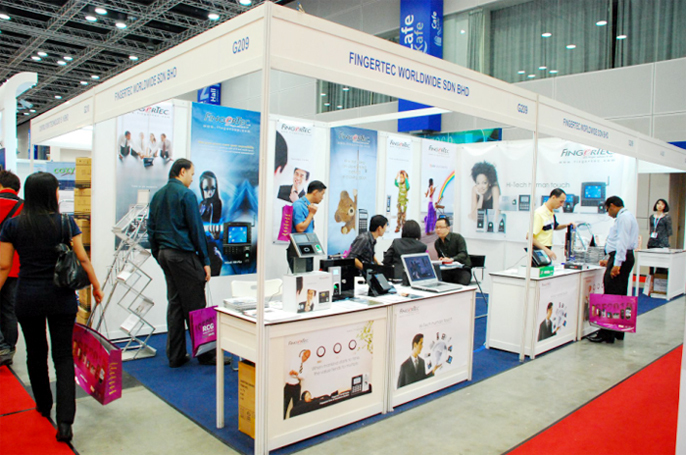 The advertisements brought some crowds to the FingerTec booth during the 4 days we were there. At this event, we introduced FingerTec's latest products including TA300 Desktop Fingerprint Reader, Keylock 8800 and Face ID2 Face Recognition Reader. Biometrics technology, though has been in the market for almost a decade, still has a lot of room to grow in the security market, as it has not reached the level of maturity that the other security products like CCTV and card reader has. Visitors were pleased with the face technology that we featured in Face ID 2. This event also was a juncture for us to get the chance to meet our dealers from overseas and all around the country. Mr. Jawad Yaacob came from Amman for this event and meeting us for the first time, Mr. Michael Wong came from Mauritius for a brief visit to the office and the expo, Mr. Yaser from Taco Malaysiaalso dropped by to say hello and not to forget our resellers such as Excel Systems, Nexo System, Binary Global and Al Qanaah Resources and also dealers from all around Klang Valley whom came to the booth for the ISF2010 exhibition.